- 7108 (1" Tubular Deadbolt, Flat Front Face Plate, 2-3/8" Backset). - Delivery: The Simplex 7108-19-41 Pushbutton Lock is factory-ordered, please allow 2-3 working days' lead time. - Special Orders: For pricing on any Simplex 7100 Lock not on this page please contact Taylor via e-mail (sales@taylorsecurity.com) or call 1-800-676-7670. The Simplex 7100 Series provides fully mechanical primary or auxiliary pushbutton access control by exterior combination, while allowing free egress at all times by interior thumbturn. Deadbolt models must be manually relocked. Deadlocking latch models automatically relock each time the door closes. This fully mechanical lock elimates the material and labor expense of battery replacements, has a single access-code and is programmed via the keypad without removing the lock from the door. Locking Device: Deadbolt - must be manually relocked. Deadlocking latch - relocks automatically when door closes. Rim locking latch - relocks automatically when door closes; also has latch holdback. Door Thickness: 1-3/8" to 2-1/4"; wood or metal. Strike: Flat deadbolt strike plate. 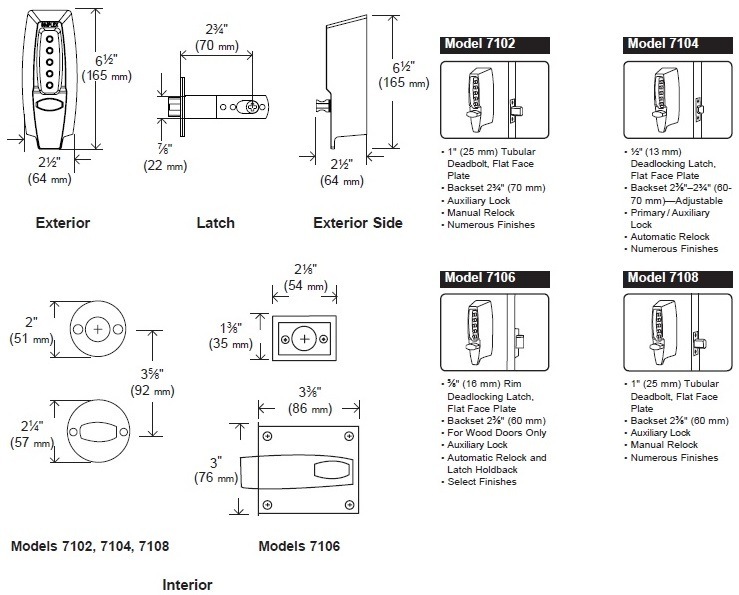 - 7108 - 1" Tubular Deadbolt, Flat Front Face Plate, 2-3/8" Backset. Special Order Information: For pricing on any function, keyway or finish of the Simplex 7100 Series not found on this page please contact Taylor Security direct via e-mail (sales@taylorsecurity.com) or call us toll-free at 1-800-676-7670. Door Preparation: 1-3/8" (35mm) diameter through bore; 1" (25mm) diameter cross bore; 3/4" (19mm) through bore; 2 x 1/4" through bores. Door Thickness: 1-3/8" (35mm) to 2-1/4" (64mm); wood or metal. Items Supplied Include: Installation manual, full-scale template and required installation hardware.